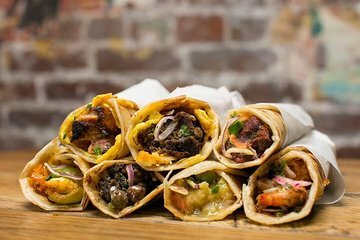 Sample some of Manhattan's best ethnic food on this 2-hour food tour with a small group. Walk around Midtown and other areas, stopping to taste samples from various different world cuisines. Travel the world through food without the need for a passport on this unique tour. Knowledgeable and passionate, not to mention plenty of delicious food from places we would never have found on our own. Amazing tour guide! A rich cultural and food experience! Was able to visit eateries I would never have found otherwise! We had an excellent time enjoying the walk, and of course, the food items and selection. We would not select those foods on our own and sample the various ethnic foods in venues without the hassle of lines. Our tour was given by Angelis and he was very personable and professional.